America is fast becoming a plutocracy, says entrepreneur, philanthropist. 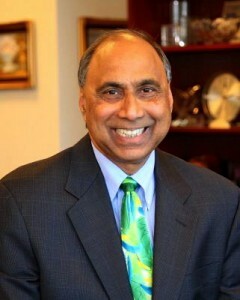 WASHINGTON, DC: Entrepreneur and writer Frank Islam was the founder and CEO of the QSS Group, a very successful IT company founded in 1994 that generated profits upwards of $300 million. He sold the company, and founded FI Investment Group LLC in 2007. Islam, who was nominated by President Barack Obama to the Kennedy Center Board of Trustees, is a recipient of the 1999 Ernst & Young Maryland Entrepreneur of the Year and, in 2001, was recognized as the Small Business Person of the Year for the Washington, DC Metropolitan Area by the US Small Business Administration. In addition to his new post at The Kennedy Center, Islam is also part of the Maryland Governor’s International Advisory Council, the Johns Hopkins University School of Advanced International Studies, and the Dean’s Council of both the American University school of International Services and George Mason University School of Management. Islam is also the co-author, along with Ed Crego, of Working the Pivot Points – To Make America Work Again [hardcover, published by IMC Publishing; 392 pages; $19.95]. I wrote this book because – for a variety of reasons today – I believe the American dream is in trouble. This book extends and amplifies the message delivered in my book, Renewing the American Dream: A Citizen’s Guide for Restoring our Competitive Advantage which I wrote in 2010. Renewing’s premise was that the United States is a nation at risk and that we are at a critical cross-roads. In that book, we observed that the actions that we take in this decisive decade (2010 – 2019) will determine the future of America and the American dream. I decided to write this book because we are in a pivotal period in this decisive decade. In the first two years of the decade and as we moved into mid-2013, there was measurable and accelerating progress in the economy writ large. There was little, however, in the economy writ small. I wrote my earlier book because I was disappointed and disturbed by the lack of unity of purpose from our leadership after the economic collapse of 2008. We had expected a coming together similar to what occurred after 9/11. That didn’t happen. In fact, the exact opposite did. We became more fragmented than ever. Unfortunately, in the following years, things have worsened. The environment in Washington, DC became increasingly toxic. The vitriol and animus that flowed outward – across the banks of the Potomac- poisoned citizens’ actions and attitudes nationwide. And, our democracy is fast becoming a plutocracy. It’s the 1% against the 99% and the 1% are winning handily. Wealth is being redistributed. But, it’s from the middle class to the very richest in our society and not the other way around. Income equality is on a dramatic rise. In the United States in 2013, we have highly partisan and divisive politicians, unresponsive business executives, and an extremely wealthy class claiming and demanding greater personal returns for themselves: These are the signs of a self-centered and stagnating society. I have written this book to shine a bright spotlight on those warning signs and to provide a framework for counteracting them. I wrote this book, as I did my prior book, as a concerned citizen who has lived the American dream and who wants to make a contribution to seeing that dream sustained for all Americans and not just the privileged few. What do you see as the most critical pivot point for America today? We have spent almost three years now covering the same old ground over and over again. We’ve had the Simpson-Bowles committee, the super committee, the fiscal cliff, sequestration, the budget fights, the government shutdown, and now we have another committee headed by Senator Patty Murray and Congressman Paul Ryan to try to achieve a resolution to a problem which we already have solutions for and which is one that exists out in the future and not in our near term. A recent report by the CBO shows that the deficit has shrunk substantially over the past two years and that the real problem regarding the deficit gap exists ten to twenty years out and not today. Most economists say we need to focus on stimulating growth as opposed to being stuck with an austerity agenda. Larry Summers wrote a good article for the Washington Post during the government shut down on the need for focusing on growth rather than making more cuts. In spite of this, we remain stuck in the “debt and deficit” quick sand. And, as happens in quick sand, the harder and harder you struggle the more difficult it is to get out. And, the longer you struggle with a single issue, the less attention that is paid to issues that matter more. Where specifically should we be devoting our attention instead of concentrating or as you would say “obsessing over” the debt and deficit? In my opinion, we need to focus our attention on what matters for most Americans and that is their individual economic well-being. In chapter six of our book, we observe that in the United States today we have increasing income inequality, a diminishing middle class, and the potential of a permanent underclass. Forget the debt and deficit. We have suffered from “attention deficit disorder” when it comes to recognizing and addressing these problems. We cannot afford to neglect them any longer. Let me explain why and what I think we need to do in these areas. In my opinion, income inequality exists for a variety of reasons. I want to highlight three. Before, I do that, however, let me say that some people think income inequality should be reduced as a matter of fairness. That’s not where I’m coming from. I believe that income inequality should be reduced for economic reasons. If the wealth in our nation is too narrowly distributed, the average consumer doesn’t have any spare disposable income and as a result, as we’ve seen from recent reports, discretionary spending at retailers declines and the overall economic recovery remains sluggish. Income inequality has a tremendous cost to our society. The Nobel Prize winning economist, Joseph Stiglitz, makes that point exceptionally well in his book, The Price of Inequality. Now for the three causes that I see for income inequality. First, there’s wage stagnation. It’s become common knowledge that the inflation adjusted wages for the average worker stand at about where they were in the early 1970’s. And, I should add the median income of a family of four has declined for four straight years now. Second, many low-skill jobs which used to pay fairly well are now gone – they’ve either been automated or off-shored. Two MIT professors wrote an excellent book on the automation issue titled Race Against the Machine. Third, there are corporate profits which for many businesses at all-time highs. As long as corporations hoard dollars rather, than reinvesting in ways that put dollars in the pockets of workers/consumers as opposed to shareholders, inequality cannot be reversed. There is no easy answer to the potential problem of a permanent underclass or a diminishing middle class. Numerous studies by organizations such as the Brookings Institution and Pew Research have documented the increasing lack of social and economic mobility in the United States and the decline of the American middle class. There is no magic wand that we can wave to change that. What we cannot and should not do though is to ignore it or to blame those in dire straits. The book has chapters on a number of pivot point areas including education, immigration, manufacturing and innovation. As I said, all of these areas are important. Let me talk briefly about two of the pivot point areas that are near and dear to my heart: immigration and education. In our chapter on immigration in the book, we make the argument that we need an approach to immigration reform that is both comprehensive and strategic. Comprehensive in that it would address border security, worksite enforcement, changes to the admission process to admit more immigrants that are economically suited to the U.S. market, and a policy to deal with the estimated 11 million people living here without legal status. Strategic in that it should be targeted to ensure that we bring in talented and skilled immigrants who have been a driving force in building the nation’s intellectual, human and financial capital. The Senate immigration bill had both strategic and comprehensive elements. As we noted when we finished our book in July of this year, we saw the odds of getting something resembling strategic and comprehensive as “slim and none.” Unfortunately, we were correct. As the House’s recent refusal to go to a conference committee on the Senate’s bill indicates, immigration is on the back burner for this year and who knows what will happen in the New Year. We will probably get something but it won’t even be half a loaf – more likely it will be just be a slice of bread. That’s tragic because we will still have the immigration issue unresolved. We can and should do better. The good news is a lot of good thinking has been done on how to accomplish this and when the right time comes the solutions that have been put forward can be dusted off and we can work the immigrant pivot point again until we get the right answer. We need to find the right answers for the educational pivot point as well. First and in my opinion, most critically, we need to implement a more systematic nationally- supported approach to early childhood education. The research clearly shows that early childhood education is what matters in closing achievement gaps between children from different socio-economic categories. Yet, at the beginning of 2013, only eight states provided pre-K education to more than half of their 4-year olds. President Obama called for a cost-sharing partnership between the federal government and the states to expand high quality publicly supported preschool programs in his State of the Union address. I am in complete agreement with the President on the need for that expansion. Second, we need to come up with holistic solutions that put the student at the center of a triangle bounded by the school, the family, and the community. We need to implement programs to support and improve performance at each of these tips of the triangle. We provide our recommendation for accomplishing this at the end of the educational chapter in our book based upon the successful work done in Union City, New Jersey and recently wrote four blogs for the Huffington Post on the same topic. The bottom line is that if we want to improve education for all we need to touch the school, the family and the community. The last chapter in the book is titled “Pivot Forward”. In that chapter, you examine where things stood at the pivot points when you finished writing the book in 2013 and provide some prognostications for the future. What is your assessment of how things stack up at the pivot points now? Are you optimistic or pessimistic? Neither – I’m realistic. As we say in the book, we wrote the book over a two year time period. During that period, in many of the pivot point areas, positive progress has either been painfully slow in coming or non-existent. We expected that to be the case given the tone and tenor of the times. And, as we point out in the first chapter and epilogue to the book, that is not atypical for key pivot points throughout American history. Change takes time. Many have rated the 112th Congress the worst in history. We began this year with some renewed hope with the 113th Congress and for a while it looked like things were getting a little better. I still think this is the case in the Senate and you see efforts at compromise and collaboration. The House on the other hand presents a different story. I don’t have to go into the details – it’s been covered by the nightly news time and time again. The question is what happens in the 2014 elections. My crystal ball is a bit cloudy. Early on it looked like the Senate might turn Republican and the House might become even more Republican. It’s far too soon to tell what will happen – as they say when it comes to election cycles, every day is a week, every week is a month, and every month is a year. What I can say with a fair amount of certainty is that there will be little positive progress on most of these pivot points during 2014. That’s because of the composition of the House, the manner in which the congressional districts are constructed to prevent competition, and the large number of Senators up for re-election in “swing” states. That’s my objective assessment of where we stand today. It’s not a pretty picture but I have to tell you it doesn’t concern me. That’s because as I researched book it became clear to me, that working and moving forward on the pivot points is a long hard slog. It is a marathon and not a 100 yard dash. It requires patience and persistence and the ability to come back again and again after defeats. In our opening chapter, we highlighted the fact that success at some of the more important pivot points in our history was far from instantaneous. Without the Bill of Rights, the United States Constitution would probably have never been ratified. Even with those Rights appended, it took three years to get the Constitution approved. The Homestead Act which was finally signed by President Lincoln in 1862 was first passed by the House in 1852. The Sherman Antritrust Act was passed as law in1892 but not really used or enforced until President Roosevelt did so in 1902. President Franklin Roosevelt was elected to office in 1932 but the Social Security Act was not passed into law until August of 1935 – about 2 ½ years into his Presidency. And, those were relatively short time frames for gestation. Think about women getting the right to vote, civil rights, and equal educational opportunity. The hands of time moved very slowly on those pivot points. But, the pivot persons for those issues stayed true to their course and cause. Some times they had to hand off the baton to the next generation but they did not waiver from their principles. We think and say give them time, too – the pivot points that is and those pivot persons (citizens and leaders) who will continue to work those points until the necessary and desired outcome is achieved. It may not be this year. It may not be the next. It may take till the end of this decade – and possibly even a little longer. Eventually it will be done because time is on the side of those with the patience, persistence and principles to work the pivot points to make America work again. We knew that success at the pivot points would not be instantaneous. That’s why we wrote the book as a work in process and a living document. Each chapter ends with a section called “Pivot Point Report Card” that allows the reader to reflect on the status in that pivot point area at the time he or she is completing the chapter. 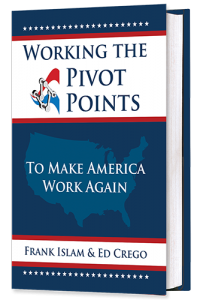 We will be posting our own assessments on progress at our book website: www.workingthepivotpoints.com.